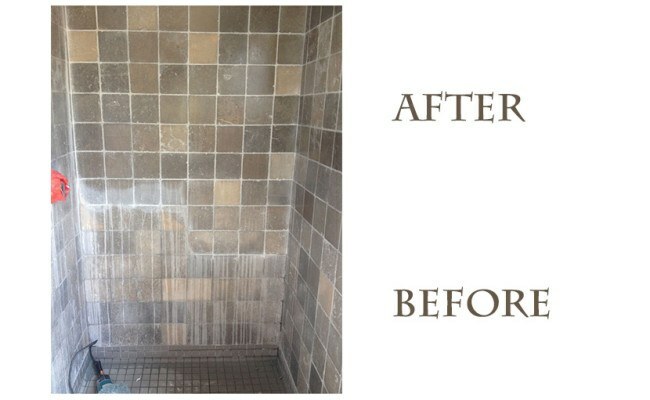 The limestone showers at Mission Bay Hyatt Hotel, San Diego, had hard water stains and etches from an acidic cleaner that was incorrectly used. The Hyatt was worried that the showers could not be restored. First, we lightly re-surfaced the stone to remove the hard water stains and etches (see the upper portion of the image to the left). Then, we used a hard water removing cleaner to remove the residual staining. Finally, we re-sealed the limestone with a solvent-based sealer to protect from future wear and tear. At Set In Stone Restoration we understand that the appearance of your business is important to you. We maintain the highest quality standards and expertly resolve any problems associated with natural stone, tile and grout. In addition, we make it a point to educate our customers on proper stone care, offering helpful tips and articles and providing expert advice for specific questions or concerns. We invite you to learn more about our commercial services and qualifications. We are dedicated to your satisfaction. Contact us online or call 619-246-0240 for a free estimate.